I regularly browse the Library of Congress's Prints and Photographs Division for pictures to illustrate essays, forums, and interviews that appear in Historically Speaking. I also use that extensive, priceless catalog quite a bit to gather material for courses I teach. 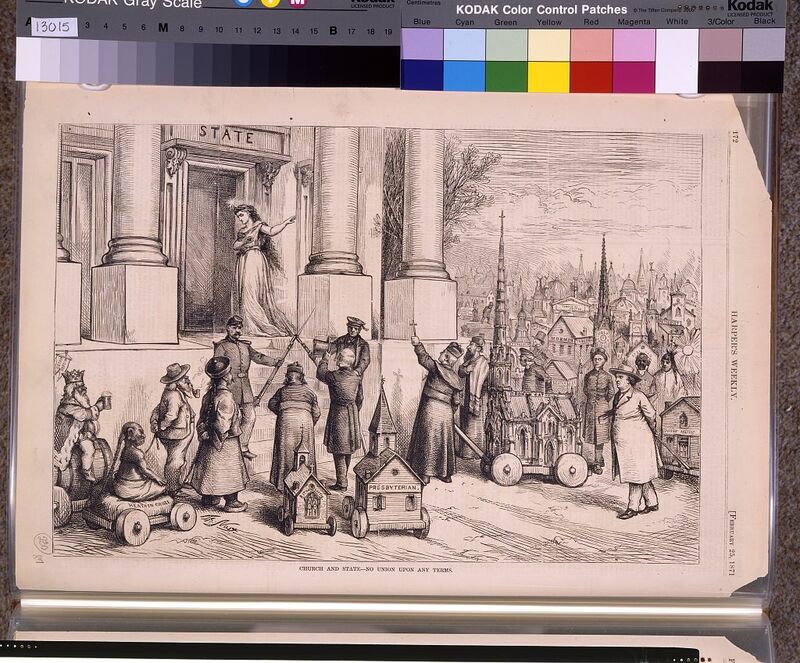 (A note to authors: the images at the LOC are almost all copyright free!) The LOC includes thousands of hi-res maps, photographs, prints, cartoons, paintings, and more, ready to download. 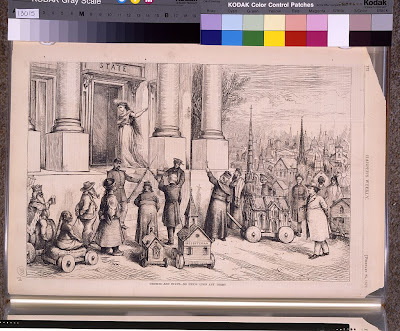 Below are some amazing LOC images from the 18th and 19th centuries, well-suited for the classroom. ( I include the brief LOC description above each image.) While we go over these in class, I like to ask students general questions like: What is the cartoonist or print maker trying to convey? 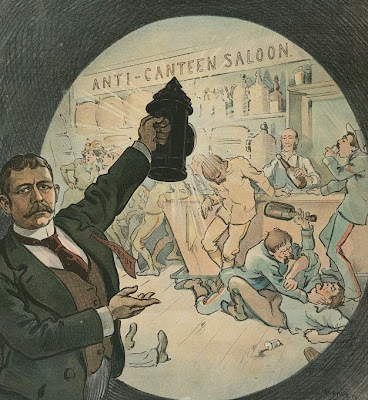 Who would find the image humorous or illuminating, and who would find it offensive or disturbing? Why? What can we learn about the issues of the day by analyzing the picture? In what sense does the picture reveal the contested nature of religion in public life? 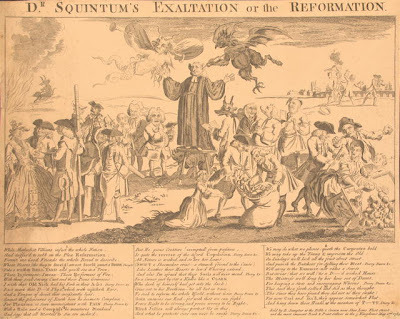 "Enthusiasm display'd: or, the Moor Fields congregation," 1739. 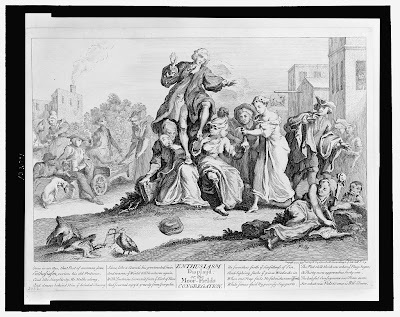 The print shows evangelical minister Geroge Whitefield preaching at Moorsfield, London. He is supported by two females, one holding a mask and labeled "Hypocrisy", the other a Janus-faced "Deceit". "Dr. Squintum's exaltation or the reformation," 1763. 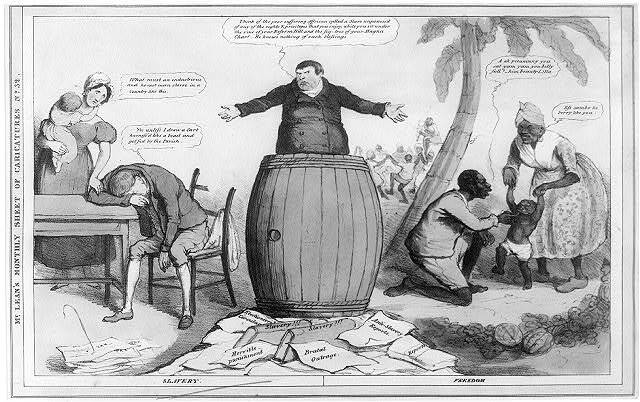 Cartoon showing Rev. George Whitefield standing on a three-legged stool, and preaching in the open air; an imp pouring inspiration through a clyster-pipe into his ear; a grotesque Fame, being a female evil-spirit, listens to his discourse with an ear-trumpet, and repeats it in an ordinary trumpet; the Devil clutches gold from under his stool; etc. "Slavery. Freedom," 1832. Two contrasted scenes divided by a huge cask in which stands, full-face, an obese and repulsive preacher with a heavy jowl, pig's eyes, and a thatch of hair over a low forehead. Detail from a Puck magazine cartoon, "Superstition Has Always Ruled the World," April 19, 1901. Satirizes the Millerites, followers of William Miller, who predicted the return of Jesus in the 1840s. "The salamander safe." A millerite preparing for the 23rd of April." 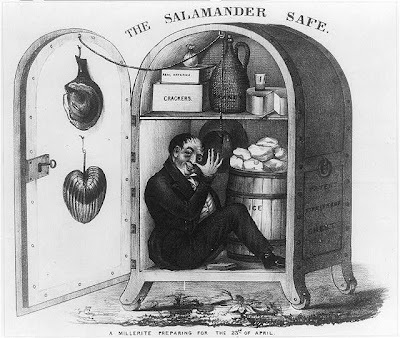 A playful caricature of a Millerite, an adherent of the Adventist preacher William Miller who predicted that the world would end on April 23, 1844. 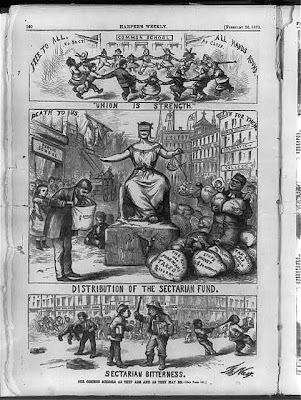 "Our common schools as they are and as they may be [Anti-catholic, anti-Tammany cartoon showing] (1) 'Sectarian Bitterness' of private schools; (2) 'Distribution of the Sectarian Fund' - all to Catholic and none to public schools; (3) 'Union is Strength' - children of all races and religions playing together," 1870. 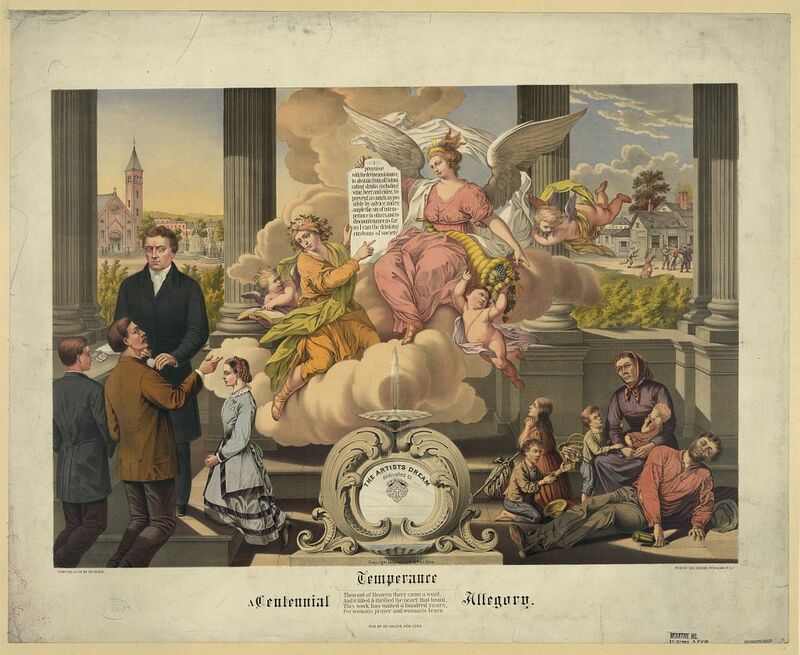 "Church and state - No Union upon any terms," 1871. A Thomas Nast cartoon showing a woman symbolizing Justice(?) standing at door of building "State", as soldiers block steps to members of different religions. "The Mormon Problem Solved," 1871. Cartoon of Brigham Young telling Pres. 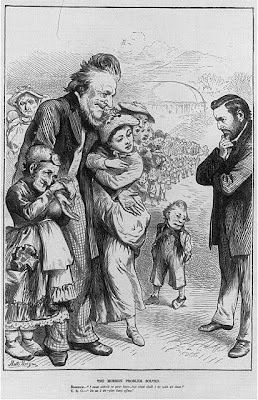 Grant "I must submit to your laws - but what shall I do with these" (hundreds of wives and children); Grant replies: "Do as I do - give them offices." "Temperance, a centennial allegory." Circa. late-19th century. These are great images. I'd love to hear you write a bit more about them, since I'm such a neophyte in much of this stuff. 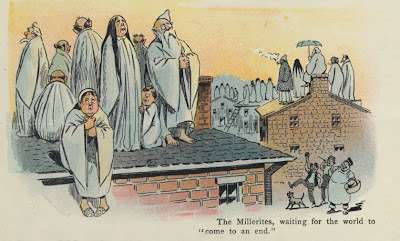 I know Whitefield, of course, but what were the Millerites, again? It would also be fun to hear some of your suggestions for teaching American religious history, or of really important things to include in a survey for those of us who focus on other topics. I teach Puritanism, but little else.